Standing in Carlos Hall, where his father served as dean of the law school, Ben F. Johnson III recalls a family history deeply entwined with Emory University. Portrait by Parish Kohanim. A new endowed scholarship has been established in Emory College of Arts and Sciences to honor former Emory Board of Trustees Chair Ben F. Johnson III. The Ben Johnson Scholarship Endowment was created in recognition of Johnson’s 18 years of service as well as the board’s commitment to scholarship endowment. Ben F. Johnson III 65C glances out an ornately arched window, quietly studying the tangled woodland ravine that rambles behind the Michael C. Carlos Hall near the southern end of Emory's main campus. Rooted amid a cluster of formal academic architecture, the urban woodland is unexpected — a deeply shaded pocket of native beech, white oak, hickory and tulip poplar preserved as a vestige of what the campus used to be. Standing on a winding staircase within Carlos Hall, the original home to Emory's Law School, Johnson is immersed in history — the story of Emory University, yes, but his own family history, as well. Histories so deeply entwined, in fact, that it's hard to know where each begins and ends. Case-in-point: It was Johnson's father, former Emory Law School Dean Ben F. Johnson, Jr., who decided in 1966 that plans for a new law school must not encroach upon that neighboring ravine — today, a natural area on campus relatively untouched by the march of time. A nostalgic sense of his own beginnings has brought Johnson back to this building — the very place he used to frequent so often as a young boy, when he would routinely accompany his father here on Saturdays. As the elder Johnson caught up on the work of reading, preparing class presentations and grading exams, his son would linger nearby, reading and working puzzles, watching and learning. And preparing, always preparing — a work ethic that has followed Ben Johnson III throughout his life. So it is that Johnson has readied himself for this day, choosing to stand here, in Emory's former law school — a building he virtually grew up in — for a formal portrait that will commemorate a major milestone, both for himself and the University that he cares for so deeply. 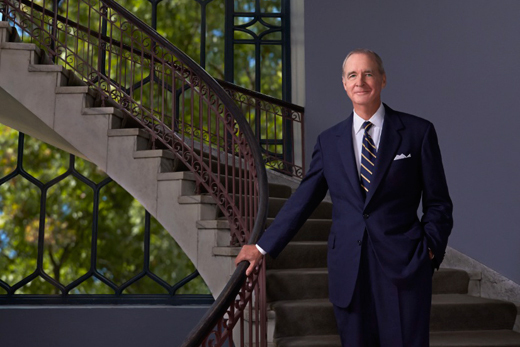 For the past 13 years, Johnson has served as chairman of Emory's Board of Trustees, shepherding a body charged with the powerful task of overseeing governance of the University, helping shape its leadership team, and ensuring its long-range fiduciary health. On Nov. 8, at the Emory Board of Trustee's annual meeting, Johnson formally relinquished that role, as the board passed a resolution to elect Emory alumnus and business executive John Morgan as its new chair. Board bylaws dictate that the board chair must step down at the age of 70 — a rule Johnson wholeheartedly endorses. "It allows the next generation to have its own shot at molding the institution, facilitating its growth," Johnson explains, noting that he'll continue to serve the board as a trustee emeritus. As for his own legacy in helping shape Emory's story, Johnson believes that's for others to decide. But there is no doubt about what has compelled him to serve a university whose history has become so entangled with his own. "A great university is a thing of unruly paradox," Johnson said. "It is a place of tranquil reflection and a testing place and indeed a battleground of outrageous ideas." "It requires stability, yet is a catalyst for change. It teaches respect for boundaries, yet encourages pushing those boundaries. It is a place of self-conscious egalitarianism, yet a place of studied rank. It trains for the sacred, as well as the secular. It gleans from the past, to prepare for the future…"
A great university, he noted, "needs leadership that understands the unruliness of the paradox, leadership that celebrates the unruliness of the paradox — and is committed to protecting the paradox, even when it is most unruly." Those words reveal much about Johnson, who not only understood the complex paradox that drives a university, but embraced it. And he took to the work with a style of leadership peers describe as calm and reflective, fair and collegial, intuitive and intelligent — and always with an eye to the horizon, the greater good of Emory at heart. For more than a decade, Johnson has helped guide Emory's fate and future, his leadership offering a steady hand at a time when a global economic downturn and societal demands created very real challenges within American higher education. To illustrate the enormity of the task, mentally flip backward through the pages of Emory's recent history to the year 2000, when Johnson stepped in as board chair — the first Emory alumnus in that role in more than 30 years. Looking back, Johnson recognizes these accomplishments as highlights of his tenure, but he's quick to label them a team endeavor, pointing to the hard work of a critical network of trustees and administrators, alumni, faculty and staff — a habit of smoothly deflecting credit that is very much his style, according to those who've served alongside him. "He's easily one of the best leaders I've ever had the pleasure of working with," says Chilton Varner 76L, a partner with the Atlanta law firm King and Spalding, who was elected to the Emory Board of Trustees in 1995, the same year Johnson joined the board. "He's got solid judgment and always does his homework, researching any issues that might be controversial, then canvassing opinion leaders and those who will be deciding an issue long before the vote, taking everyone's views into account," says Varner, one of three Emory trustees who've recently transitioned to trustee emeritus status along with Johnson. "And he's one of the most unflappable people I've ever met. Everyone respects his judgment — of course, he always does the right thing, so that helps," she adds, with a chuckle. Many point to Johnson's strength in nurturing strong relationships as a key to his success. For example, in Emory faculty, Johnson saw the potential for partnerships. So he helped create Faculty Counselor positions to serve on each of the major board committees — an opportunity for faculty engagement in University governance that would bring with it new eyes and insight. In fact, Emory Trustee Douglas Ivester ascribes Johnson's forward-looking leadership with "setting in motion an altogether more modern way of approaching management of the University." "Ben set the clear expectation that leadership should be strong and creative, and it should be guided and supported by the Board of Trustees, not managed by it," says Emory University President James Wagner, who credits Johnson with seeing the board through an important expansion of both size and member diversity. "His legacy is one of thoughtful, principled, and disciplined governance, unrestrained from challenging leadership to greater aspiration," Wagner adds. "A lot of the time, good leadership is knowing when to keep your mouth shut, when to collaborate, and when to get out of the way and let others do what they do best," Johnson explained recently over lunch at The General Muir, a restaurant his son and daughter-in-law helped launch earlier this year at the Emory Point development along Clifton Road. However, fellow Emory trustees insist that that behind Johnson's calm, laconic exterior — many compare him to Jimmy Stewart, others to Atticus Finch — is a whip-smart legal mind. They describe a man with fierce intellectual curiosity, deeply rooted community connections, and an intuitive grasp of both human nature and the delicate art of politics — all tempered with a bone-dry wit. Once, during a board discussion about the possibility of a slogan or catch-phrase to celebrate Emory's 175th anniversary, Johnson wryly suggested: "Emory: 175 Years Without a Bumper Sticker." Johnson himself acknowledges that his somber demeanor can be misleading. Perhaps, he suggests, his tombstone should someday read: "He enjoyed it more than he seemed…"
"I just happen to be born with a mournful visage," he quips. "I'm not really a sad person." But as Johnson himself has observed, "sometimes the most effective change agent looks least like a change agent." Johnson honed his leadership skills as the managing partner of Alston and Bird, an Atlanta-based law firm frequently recognized as one of the nation's top employers — winning a spot on FORTUNE magazine's list of "The 100 Best Companies To Work For" for 14 consecutive years. "Even back in 1980, when I joined the (Alston & Bird) law firm, he was a budding leader," says former Georgia Supreme Court Justice Leah Ward Sears 80L, who has served on Emory's Board of Trustees since 2010. Years later, as a jurist on the Georgia Supreme Court, Sears would encounter Johnson again; this time he was one of the major forces behind a civil rights lawsuit that Alston & Bird was handling pro bono, she recalls. "I'll always remember him for standing up where many people wouldn't stand up — standing up for things that really matter, in a way that some would shy away from," Sears says. "He's got a backbone made of steel." In his role as chair of Emory's Board of Trustees, those strengths were obvious, she says: "You really have to work hard to lead. It's not easy. You just have to plow deep, and he did it — at the same time, he was also involved with other leadership roles with many other civic groups throughout the community and the managing partner of his law firm." That passion for public service? "It runs in the family bloodline," Sears insists. "You know, it was his father who decided that Emory Law School needed to enroll its first black student," notes Sears, who is herself African American, among a wave of women and minorities drawn to law schools in the late ‘70s. "Ben just took that mantle right up, that strong sense of service, of connection to the community," she adds. "He's a do-the-right-thing kind of guy, it's just that simple." To understand the catalyst for community engagement that drives Ben F. Johnson III, it helps to understand his father — a pivotal force in his own life and a change agent for Emory. "[Ben's] legacy is one of thoughtful, principled and disciplined governance, unrestrained from challenging leadership to greater aspiration." Ben F. Johnson Jr. was born in 1914, before Emory had even established an Atlanta campus, and grew up in what would come to be known as the Virginia-Highland neighborhood. The elder Johnson won a scholarship to attend Emory during his freshman year. By the following year, the Great Depression had taken its toll; Emory University — and others like it — could not continue to fund the scholarship, Johnson recalls. So his father dropped out of college, working in a five-and-dime store to make ends meet, eventually attending classes through "the evening division of the University of Georgia," now Georgia State University. By his senior year, his father had enrolled at the University of Georgia, intent on studying Greek and Latin "because he wanted to go to law school," Johnson says. "I think he was drawn to the law as an instrument of change and justice," he muses. "I think I was drawn to the law because that's what he did." After graduation, Johnson Jr. was accepted to attend law school at Harvard University. But due to his own father's poor health, he elected to stay closer to home, enrolling instead at the Emory Law School, where he graduated first in his class in 1939. After practicing law with the Atlanta firm of Sutherland, Tuttle and Brennan, Johnson Jr. served in the U.S. Navy in the Pacific during World War II. Returning home, "he decided what he really wanted to do was teach," according to Johnson. Johnson Jr. joined Emory's law faculty in 1948, serving as dean of the Emory Law School from 1961 to 1973 — a time of social and cultural upheaval throughout the American South, as the civil rights movement began to find its voice, leading Emory to a defining moment. In 1962, Johnson Jr. joined Emory Board of Trustees Chair Henry Bowden Sr. in arguing a landmark legal case before the Georgia Supreme Court, successfully challenging a state law that denied tax exemptions to integrated private schools, even though the state had already desegregated public institutions. In 1965, Emory admitted its first full-time African American law students: Marvin S. Arrington, Sr., who would later become a Fulton County Superior Court judge, and Clarence Cooper, who would go on to serve as U.S. District Court Judge for the Northern District of Georgia. The following year, Johnson Jr. began seeking foundation support for a program to help recruit African American law students. Looking back, Johnson openly acknowledges the weight of his father's achievement: "He systematically changed the world in which he lived." As for what compelled him? "My father taught Sunday School in the Baptist Church for over 50 years," Johnson explains. "He thought it was his mission to get people to think right." That passion for engagement would remain with Johnson Jr. throughout his life. In fact, not long before his father's death in 2006, Johnson recalls stopping to visit him en route to an Emory Board of Trustees meeting — only to find his nearly 90-year-old father heading out the door. "You can't stay for long, I've got to go," Johnson Jr. cautioned. "Where are you going?" asked his son. "Well, I'm going to speak and demonstrate," he responded, heading off to tackle yet another social injustice, primed to fight the good fight. Throughout his father's final years, Johnson enjoyed taking him on drives; together, they would chart the growth around Emory's main campus. Inevitably, Johnson Jr. would marvel at the changing landscape, recalling how "this was just all woods, when I was a kid." "So Emory grew up with him," Johnson explains. "And he was there every step of the way for a long, long time." When it came time for Ben Johnson III to attend college, there was little question that the prospective English major would choose a liberal arts education at Emory. By then, the University was practically extended family, with key campus leaders and faculty often dropping by the Johnson house for dinner and dialogue. And with his father on faculty, Johnson was able to attend Emory on full scholarship. Academically, "it was like being a kid in a cafeteria with an unlimited allowance," Johnson recalls. "I felt deeply indebted." Johnson pauses: "Actually … if you want to know the greatest reason why I feel indebted to Emory, it's because I met (my wife) Ann here." It was the fall of 1963 — 50 years ago this semester. "She had joined the Emory Women's Chorale and there was a student event I was supposed to have some role in and there she was, the most beautiful woman I had ever seen," he recalls. "We started dating and have been together ever since." Johnson plunged fully into the Emory experience, from participating on The Barkley Forum and Interfraternity Council to the Honor Council and an assortment of honor societies. At graduation, Johnson received the Marion Luther Brittain Service Award, the University's highest student honor in recognition of service and leadership. "Frankly, I don't know anybody with the range of civic and charitable contributions that Ben has made," Varner observes. "It's really kind of amazing when you think about it. In 1995, Johnson was asked to join the Emory Board of Trustees as an alumni trustee. The decision, he says, was easy. "I came to realize that if I could be of help, I wanted to," he recalls. As Vice President and Secretary of the University, Rosemary Magee has worked closely with Emory's Board of Trustees around governance issues, helping set an agenda for Emory's future. Through Johnson's intuitive leadership, Magee says she's come to see him as the literal embodiment of "The Wise Heart" — words embedded in the Emory motto that "capture a sense of wisdom of the heart and all the kinds of knowledge that we seek," she explains. "I think that sums up his work and contribution and impulse." Over the years, the gift of wisdom would prove critical in leading Emory through times of conflict and challenge. During Johnson's watch, the University released a formal statement of regret for its historic ties to slavery, confronted a pattern of discrimination against Jewish students in Emory's now-defunct School of Dentistry, and acknowledged the discovery of misreported data to US News & World Report. And yet, it was the University's forthright response to those moments that fill Johnson with his greatest pride. "As a basic proposition, I say you can't be comfortable with yourself if you are estranged from your past," he asserts. "There's something fundamentally wrong with that." Looking back over the last 13 years, Ben Johnson III is comfortable with his past — proud to have helped secure a leader like President Wagner, to witness the growth of both campus improvements and the impact of Emory Advantage, a financial aid initiative which has enriched Emory's student body, pleased to have been able to give back to a University that has given him so much. If the life of a university is fundamentally "an unruly paradox," Johnson found a way not to conquer it, but to appreciate it, to harness it, to shape it. Not only did he understand that complicated dynamic, Johnson simply stood back, and with his own wise heart, allowed that very force to help Emory University grow and thrive and become — in the end, perhaps his greatest gift of all.